Here you have access to recent children's books I've illustrated as well as my artwork in the form of prints, clothing, and other decorative and useful items. Much of my artwork is affordably customized, allowing you the option of taking a theme that appeals to you and embelishing it with a personalized touch in the form of names or a message that suits your occassion. 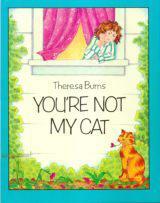 Written by Todd Richard Schwartz, illustrated by Theresa Burns. Published in 2008 as the first in "The Aspen Bears" (TM) trilogy, the book provides children with an insight of preceived and actual differences in the lives of two bears. 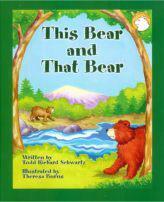 A chance meeting and grand adventure cause This Bear and That Bear to realize they are not so different after all. Available through The Aspen Bears website by clicking on book. Written and illustrated by Theresa Burns. Published in 1989. All who have ever been owned by a cat will recognize the feelings of this little girl who befriends a stray orange cat. Available through Amazon via the link below. Aprons, Mousepads, Mugs, and more, Customized by You ! My illustrations are available on a line of products, most of which may be affordably customized with your name or message and usually having a lead time of 24 hours. Clicking on an image in the rotating display below takes you to the product page for the product displayed. To browse around the store, click on the menus at left of product. To go to store home page and leave a comment, click on the "neET illustration" logo on any product page.